West Side Runners' Club (WSX) - a competitive running team based in New York City and the tri-state area embracing runners of all distances and abilities. Best of 2:36:55. 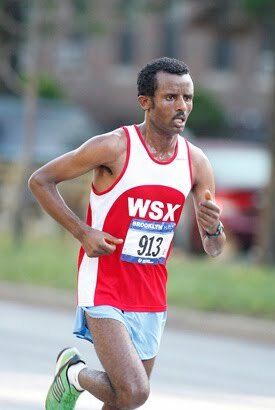 Alem Ashebir finished 30th in 2:48:13 while other WSX runners dropped out due to the harsh weather. a huge trophy and of course the men's team won yet another Brooklyn triple crown race. WSX men to yet another victory as Muliye Gurmu (4th) and Alem Ashebir (5th) helped the women's team come in 2nd. Julio Aguirre & Edgar Sandoval each won their repective 60 year old age groups. and Kathryn Vomero Santos organized a Portuguese Picnic after the race. Half Marathon (easy victory) in 1:14:52. 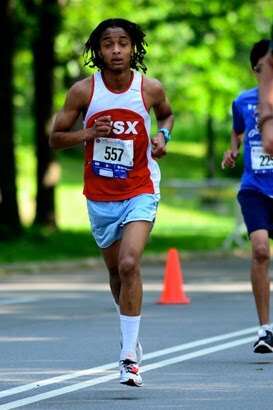 Exkyas Sisay was also there and won for the men in 1:03:58.
compliments of Van Cortlandt Track Club. A tough hilly course but a great meal was served after the race which had many amenities. team to first place ! Evelin Gomez was 2nd junior and Sharon Antoine outkicked Mary Wittenberg & Jack Waitz at the finish..
Memorial 100 Mile Trek in Queens during Memorial Day weekend. His total time was 14 hours and 19 seconds. Worku Beyi. Misiker Mekonnin Demissie came in second place in a spectacular time of 2:25:21, also a personal best. All the WSX runners were cheering when they heard of these results at the Kenny Dolan race - remarkable achievements. Buzunesh also broke the California Marathon record for that State with her 2:23.
ceremony, much of it incorrect, finished 6 1/2 hours after the race began. Beer flowed freely however after the race. was a commentator. You can check out the photo of Ketema and Worku in black.shirts. as Sharon Antoine, gorgeous in victorian white, married WSX webmaster tuxedo clad Ralph Yozzo in an intimate wedding in Saint Ephrem Catholic Church in Bay Ridge, Brooklyn. The bride, [on time, but limo was - bride's addition] fashionably late, regally stepped up the aisle to Wagner's Lohengrin Wedding March. Several WSXers were in attendance, Margarito "Juan" Diaz as best man, Felipe Vergara and Kurt Joseph as ushers smartly dressed in tuxedos, turquoise vests and patent leather shoes. Chip Tilden as official photographer (he took well over 2000 photos), Bill Staab, Angel Confesor and his wife, & Lisa Castillo also reveled at the reception at a Knights of Columbus hall nearby. The sun was shining brightly on the new couple. Sharon managed to elegantly charm the assemblage every dance despite a long train on her dress - dinner, wedding cake, the throwing of the bride's bouquet (3 times no less) - the fun and relaxing reception lasted into the night. After a wedding trip to New England the Bride and Groom will be settling in Park Slope. .
Megersa won the 5K in a smart time of 14:26. Two seconds behind Tesfaye Assefa Dube placed third. of 29:37 which was the first sub-thirty time in the race since 1999.
start instead of the usual 70 or so for the Brooklyn Half. For some reason there were only 5900 finishers - last year over 7200.
finished. The WSX Men's Masters team was also 2nd (Vergara, Alberto Gomez, Cosme Luna). 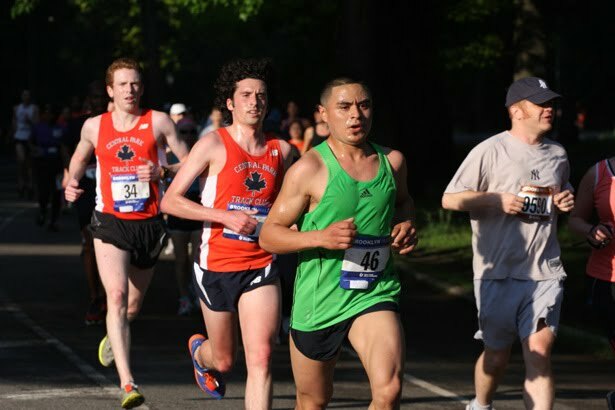 hour runs breaking the USA record by running 257.34 miles in 48 hours in the "3 Days at the Fair"
The Healthy Kidney Elite 10K in Central Park May 14, found Tesfaye Girma top WSX runner in a smart 28:24 for 6th overall. newly joined the WSX was 5th male. The WSX men's team was the obvious winner but surprisingly the WSX women's team was 2nd. 2nd overall in this May 6th race and Tesfaye Assefa Dube was 4th. was 9th, Worku Beyi 15th and we understand that Ezkyas Sisay dropped out. All WSX finishers received prize money. Yihunlish Delelecha Bekele was 2nd woman. Prize money for all WSX runners. followed by Felipe Vergara. Ricardo Cuahuizo opted for the Half coming in second while Jaime Palacios won his age group. 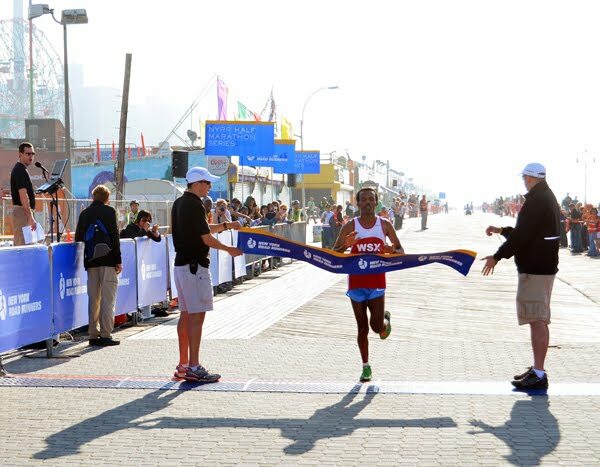 In the 10K Demesse Tefera easily won the 10K with Angel Confesor in 2nd place. run with no times, no age group awards. Participant numbers were down and all times are unofficial - quite a waste of time and money. reports the race started 8 minutes early and Teklu Tefera Deneke missed the race altogether. was 4th and Hirut Mandefro lost 1 1/2 minutes but came in third via chip time. 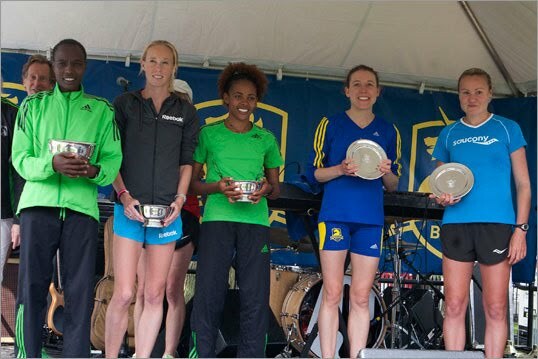 On a very rainy Saturday before Easter, Aziza Aliyu swept in to victory in the NYRR 4 Miler in Central Park on April 23. She led the women's team to 2nd place (And no, Anna Dee - no team medal - you were 6th on the women's team this time). NYRR had posted that there was prize money for this race but 2 days prior to the event, they swept the posting away - no prize money. 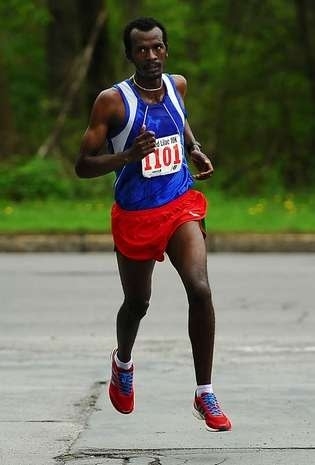 Go Javi in the 2011 Boston Marathon! Gurmu, a formidable WSX women's team. first place Senior (60-64) as usual. was third overall in 2:04:53. There was a strong tail wind so the 2:03 world records broken may or may not stand. 2nd Male finisher in 49:24. & Cesar Estevez, the masters team (over 40) was in 4th place, and the senior team led by Julio Aguirre was also 4th. The WSX women came in 15th team, Meraf Tenaw earned 1st Junior, Jaime Palacios 1st 55-59. A total of 65 WSXers ran. South Carolina 10K, Retta Feyissa was 36th. finished 9th in 29:44. Friends Abiyot, Derese and Alemtsehay were also competing. Bado Worku Merdessa must have outkicked Ezkyas Sisay for 3rd place as they both ran 29:15. Go West Side! Go Mustafa!!! trail. Javier Rodriquez finished 4th overall followed by Ponciano Ramirez. Julio Aguirre was 2nd Senior. category 1-2-3 mopping up all the Junior awards and the men's team was again first. 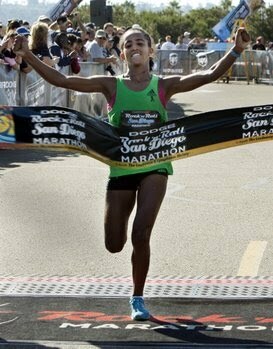 Buzunesh Deba put all before her in the rainy Los Angeles Marathon with a steller 2:26:34 PR on March 20, 2011. 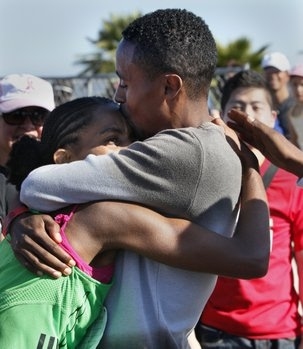 She was the first Ethiopian woman ever to win the Los Angeles Marathon. She will be back in New York next week. BOTH THE WSX MEN'S AND WOMEN'S TEAM GARNER FIRST PLACE. EZKAYES SISAY RUNS 1:01:56 FOR 10TH. 1:14:16. Luis Porto was 4th junior in 1:17:50 and Evelin Gomez ws 3rd Junior..
outsprinted several guys to win the rainy Coogan's Salsa Blues 5K in Washington Heights in a time of 14:42. (who was training for the Los Angeles Marathon in Albuquerque) were both the overall winners for the second straight year. Bado made a short 6 word speech, "Thank you, Thank you, Thank you"
Aziza Aliyu also repeated as female winner age 20-24 and Kumsa Adugna-Merdessa emerged as male winner 20-24. Porto who won that award last year, but who is now 15, grabbed the male age 15-19 award against all the older guys. used to give out good Sweatshirts, then colored long sleeve shirts, but alas now only churned up inexpensive white shirts. late entry fee was $ 30. Ricardo Cuahuizo was 6th overall and Armando Ramirez was 7th. which took place on Super Bowl Day, February 7th and helped place the men's team in second place. Evelin Gomez all won age group awards. among the women in the same race. and Ezkyas Sisay was 6th overall in 1:06.
teams were not strong, the WSX men copped only 4th place with Ricardo Cuahuizo first WSX finisher in 1:16:43.
candidates for Male Runner of the Year. Buzunesh & Bado were the overall winners last year. policeman directed them off the course and up a hill and the 3rd guy, the American Luke Watson, went correctly and passed them. time. Bill Staab also went there to cheer the WSX runners on. his new age category). Alex Juarez was 2nd 55-59 & Julio Aguirre 1st 60-64. Evelin Gomez was 1st Junior. The Men's team was 1st Place Team.